She has nothing to prove to you. Her brother Gideon may be the face of the Order of Eathyron, but Commander Gwendolynne Heavensbrand is its fist. This skilled warrior and strategist remains a step ahead of her enemies at all times as she commands her troops from the front lines. Her hardened outlook is often at odds with her brother's idealistic leadership, but her grit is essential to the Order's survival. It's a bit funny, honestly (and entirely unplanned) that while doing the Mythic Legions Series 1 reviews, we took a bit of a break, then came back to them with Gideon Heavensbrand; and now that we're doing the "Advent of Decay" reviews, we've taken a bit of a break, and find ourselves coming back to them with a review of his... wait, do you think she's his big sister or his little sister? Presumably their parents pushed them both into service to the church - dollars to doughnuts their dad was some kind of church bigwig before the big schism - but did Li'l Gideon get the top slot because he was older, or because he was male? Or maybe it was just because she wasn't interested in anything that didn't involve smiting. Like her friendlier brother, Gwendy wears golden armor. They could have given her the tabard pieces seen on the Knight Builder set, which would have matched him more closely, but if she's out in the world Phasma-ing it up, maybe she finds such fancy dress extravagant. She's probably even unhappy that she has to be gold and not something easier to clean and care for, but this was the only armor they had for her. While Gideon's armor was just gold with silver lining, this one adds some purpley maroon accents, which are matched by an ostentatious plume of purple feathers. Now, let's talk about her beaver! The beaver (also known as the visor, but that's not as much fun to say) on the previous Heavensbrand figure had multiple positions, but it wasn't technically movable: you could plug it in so it was either up or down, but that was it; this Heavensbrand's visor is mounted on actual hinges, so you can slide her beaver up and down as much as you want. Go ahead and deicde how much of the face should be covered by the beaver. Should the beaver just be on the face a little? Or should her face be all up in that beaver? I know which one I'm voting for! Also, for some reason I'm pretty sure DJ Khaled would have an opinion on this. For the Series 2 Kickstarter, the Four Horsemen channeled the huge flood of fan money not into more and more characters, as they'd done with Series 1, but into more and more accessories for the characters we were already getting. For instance, once the pledges crossed the $750,000 mark, Gwendolynne immediately got the benefit of a second, un-helmeted head. 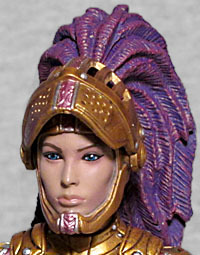 The face on this one looks like the same woman as the standard head (as it should), though the hair cascading over her shoulder suggests a stricter hair-care regimen than you'd expect from someone who's only interested in battle. 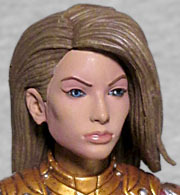 And we certainly wouldn't have made this comparison a week ago, but don't you think she looks a bit like Lori Laughlin? The Mythic Legions figures are incredibly well-articulated, and also incredibly modular. Gwendolynne Heavensbrand has a balljointed head, swivel neck, swivel/hinge shoulders and elbows, swivel forearms at the top of the gloves, swivel/hinge wrists, a balljointed torso, swivel waist (though that's more for construction purposes than play and poseability), swivel/hinge hips, swivel thighs, swivel/hinge knees, and swivel/hinge/swivel ankles. Pretty much every one of those joints can be pulled apart with only a modicum of force, so if you want to create your own custom figure, it'll be easy enough to do. The only trick will be finding another figure whose colors match these. 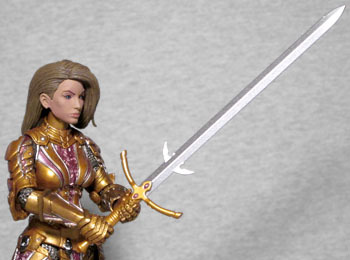 The bare head wasn't the only extra Gwen got; at $645,000, she acquired the large broadsword from the Knight Weapons pack, a nice, impressive weapon that definitely looks intimidating in her hands. (Yes, it was added before the head, but we're mentioning it after.) She's also got the standard sword and strap, the same shield Sir Ignatius carried, and the shoulder pauldrons and wing-mounts that are pretty much standard for the series. 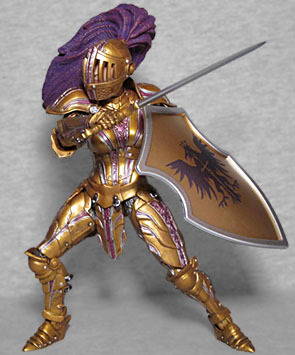 Gwendolynne Heavensbrand would be a cool figure even without the extra pieces (a golden lady-knight? Heck yeah! 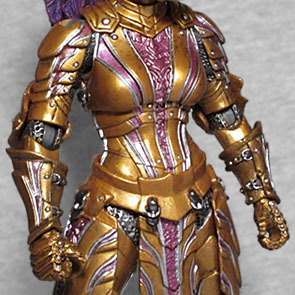 ), but the alternate head and rare sword really bump the quality up even more.